In Britain their are two types of squirrel: Red Squirrels and Grey Squirrels. Grey squirrels have drastically displaced the red squirrel. Squirrels have four teeth in the front of their mouth. Their teeth grow constantly throughout their lives to prevent their teeth from wearing down. Their padded feet cushion jumps from up to 20 feet. They are able to see a majority of their surroundings without turning their heads. They are runners and able reach up to 20mph. Habitat includes forests and woodlands and where a majority of food will be found. The Grey squirrel is a tree squirrel in the genus Sciurus. It is native to eastern North America and in Britain it is regarded as an invasive species and has threatened the native red squirrel since its introduction by humans. Grey squirrels have predominantly grey fur however it can also be a brownish color. Their main features are a large bushy tail and a white/grey underside. 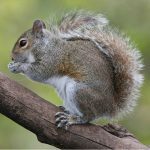 They grey squirrel has a typical head and body length of 23 to 30 cm (9.1 to 11.8 in), tail length of 19 to 25 cm (7.5 to 9.8 in) and a total mass of weight between 400 and 600 g (14 and 21 oz). They eat a range of food; tree bark, tree buds, berries, seeds and acorns, walnuts, and other nuts, and some types of fungi found in the forests. They can cause damage to trees by tearing the bark and eating the tissue underneath. In Britain, the sycamore and beech trees suffer the greatest damage. Squirrels often raid gardens for tomatoes, corn, strawberries, and other garden crops. Sometimes they eat the tomato seeds themselves and discard the rest of the vegetable. They are also known to raid bird feeders for millet, corn, and sunflower seeds and denying wild birds food. A scatter-hoarder; hoarding food in numerous small caches for recovery later. Some caches of food are temporary such as those made near a source of abundant food. More permanent, secure and food caches are left for weeks or months. Squirrels tend to make several thousand caches each during seasons. Grey squirrels have very accurate spatial memory for the locations of these caches. Landmarks and smell help serve help uncover them. Their habitat is typically large areas of mature and dense woodland that contain sufficient food sources and plenty of shelter. Their nests are usually high up in large tree branches and within the hollow trunks of trees, or within abandoned bird nests. Moss plants, thistledown, dried grass, and feathers provide nests with warmth and insulation. Running around in attics and wall voids. Home maintenance: check windows and roofs regularly for cracks and wear, in particular signs of gnawing. Check and seal chimneys with mesh coverings and replace open chimney pots with grilled pots.